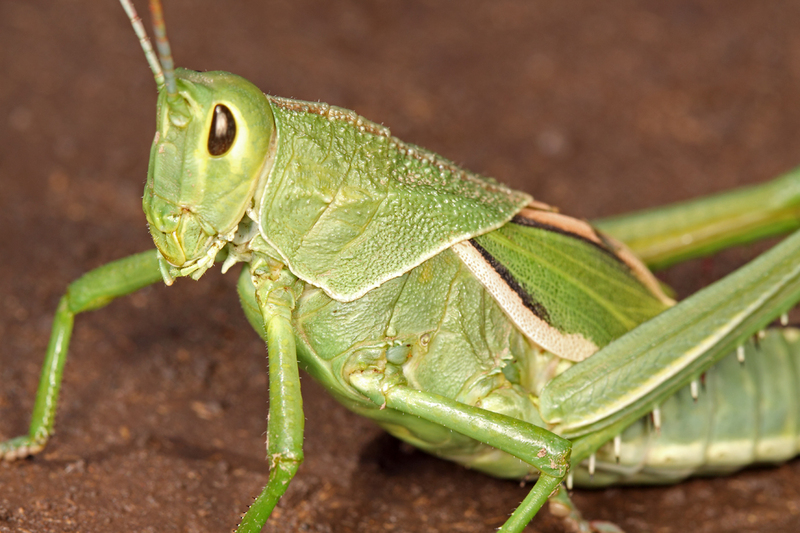 Tucuras, langostas, and saltamontes are names in Argentina for what we in North America call grasshoppers (order Orthoptera, superfamily Acridoidea). 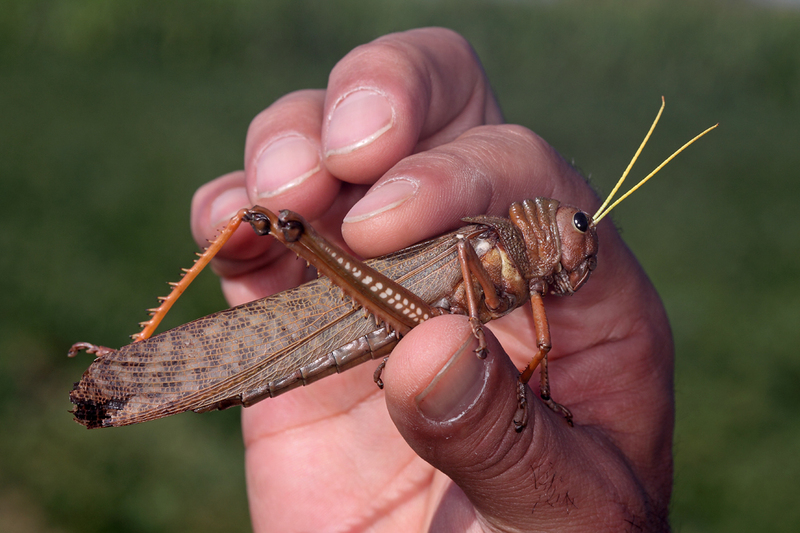 Argentina certainly has its share of species, some of which can only be described as “gigantes”! During my first week out in the field at my home base here in western Buenos Aires Province, I encountered the hefty-bodied female in the photo below and was immediately reminded of a similar-looking individual I had photographed in neighboring Córodoba Province during my March 2011 visit. Both had short but well-developed wing pads that at first suggested they might be mature nymphs of an incredibly large species. 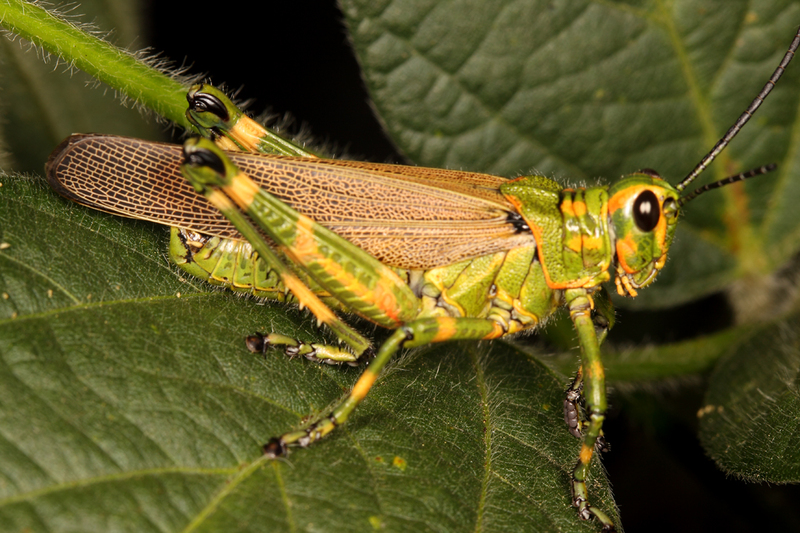 However, when I noted both were females I decided they likely represented adults of some type of lubber grasshopper (family Romaleidae), many of which—especially the females—are brachypterous (short-winged) and heavy-bodied as adults. A little searching revealed that both belong to the genus Elaeochlora, each looking very much like the species pictured on an Argentine postal stamp and identified as E. viridis (update 9 Mar 2012 – Sam Heads has identified these as Staleochlora viridicata). One of the more colorful grasshoppers I have seen in Argentina is Chromacris speciosa. The individual below was photographed last March in eastern Córdoba Province, also on soybean. It’s tempting to presume that the green and yellow coloration has a cryptic function, but apparently the nymphs of this species are brightly colored red and black and have the habit of aggregating on foliage. This is classic aposematism (warning coloration) to indicate chemical protection from predation, so perhaps there is a similar function to the adult coloration as well. 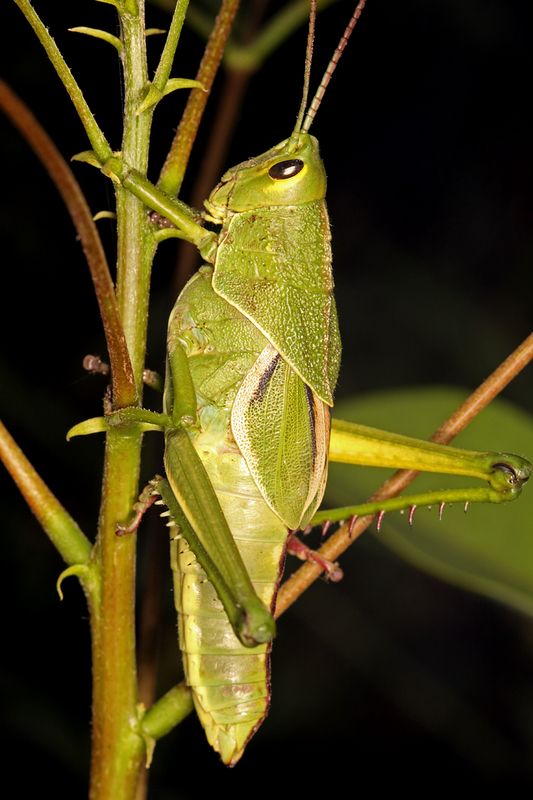 This entry was posted in Acrididae, Orthoptera and tagged Argentina, chemical defenses, entomology, grasshoppers, insects, nature, predator avoidance, science. Bookmark the permalink. Could be the same thing, as Sam indicates below. Spanish “Quebracho” is a tree with hard wood, I heard it translated as “ironwood” in Baja California. So “quebrachera” is the consumer of the quebracho tree? An interesting name, whatever the exact meaning. Yes, that’s correct. The name has been applied to a number of trees, but white quebracho (Aspidosperma quebrachoblanco) is where the grasshopper gets its name. Great post Ted — It’s good to know you’re having fun down there in Argentina; it’s a wonderful country and the grasshoppers are magnificent. Splendid shots as always: The first two photos are Staleochlora viridicata. Also, Eutropidacris was synonymized with Tropidacris by Otte (1995). T. cristata is truly something to behold and is very widespread across much of South and Central America. Hi Sam – thanks for the additional ID information (I was hoping you would come through). Did I mis-ID Staleochlora or is that a more up-to-date name? My pleasure! Regarding Staleochlora: it’s a straightforward misidentification. Elaeochlora is a junior synonym of Agriacris having been synonymized by Roberts & Carbonell (1992, J. Orthop. Res. 1: 75-106). It’s simple enough to confuse Agriacris and Staleochlora however. The Roberts & Carbonell paper is very useful and I can send you a copy if you want it. Love the grasshaoppers! And…Not exactly a grasshopper, but if you run into a certain relative of them that looks a lot like our North American Oecanthus argentinus (prairie tree cricket), I know someone who’d really like to sequence its DNA.